You're out in a boat with a very experienced sailor friend when he starts feeling ill, then collapses on the deck and passes out. You don't know enough to pilot the boat yourself or even how to operate the radio, but there are some flares onboard and instructions showing you how to fire them. You can see there are other boats far off in the distance so you figure it's worth a try. You fire off a flare and it shoots skyward, blazing red high above you. Then you fire off a second one to be sure. Within minutes, the boats are coming toward you and you breathe a sigh of relief; you know help is on its way. Thank heavens for flares, which have saved countless lives at sea. They're fantastically simple signaling devices similar to fireworks, but they're designed to communicate a much more direct message in an emergency. Have you ever wondered what they're made of and how they work? Let's take a closer look! Photo: Flare guns like this are used to fire distress signals and warnings at sea. Photo by Joshua Wayne LeGrand courtesy of US Navy. Photo: Handheld smoke flakes: Top photo: A group of Minnesota Air National Guardsmen ignite MK-13 flares during survival training. Note that they're wearing gloves to protect against the heat the flares give off. Photo by Erik Gudmundson courtesy of US Air Force. 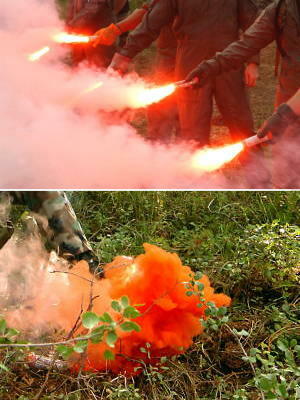 Bottom photo: Here, a smoke flare canister is being used to signal troop positions to a helicopter during a search-and-rescue survival exercise. You can just see the flare on the bottom left (it's the white tube with orange ends). Photo by Brandt Smith courtesy of US Air Force and US Navy. A flare is a tube packed with explosive chemicals that burn very brightly or give off smoke, usually to attract attention in an emergency. The two main kinds are handheld flares (which operate on the ground) and rocket flares (which are fired into the air). Handheld flares also come in two kinds. 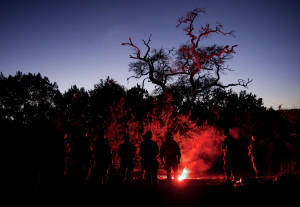 Signal flares burn with a bright red light as you hold them, while smoke flares (also called smoke signals) are designed to be held in the hand, placed on the ground, or dropped overboard into the sea to give off huge plumes of colorful (generally orange or red) smoke. Flares like this are typically visible up to about 5km (3 miles) away for anything from 30 seconds to several minutes. Since smoke doesn't generate light, smoke flares are useful only in daylight. 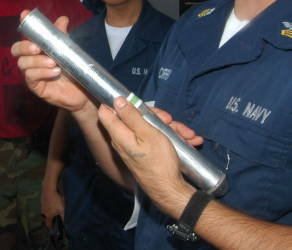 Photo: Rocket flares are packaged in aluminum canisters like this. By Joshua Wayne LeGrand courtesy of US Navy. Rocket flares are bright enough to work in daytime or night. They're usually fired high in the air so they can be seen from much greater distances than handheld flares (up to 40km/25 miles or so in good visibility). The simplest ones are like fireworks, with two "stages" (separate explosive burning sections) and are entirely self-contained. You hit them on the base (or bang them on the ground or the deck of a ship) to strike an explosive percussion cap. This triggers the first stage, which propels the inner part of the flare into the air for several seconds. At that point, when the rocket has reached a height of maybe 100m (300ft) or so, the second stage ignites and the flare explodes with an intensely bright red or orange light. Some flares release red stars. 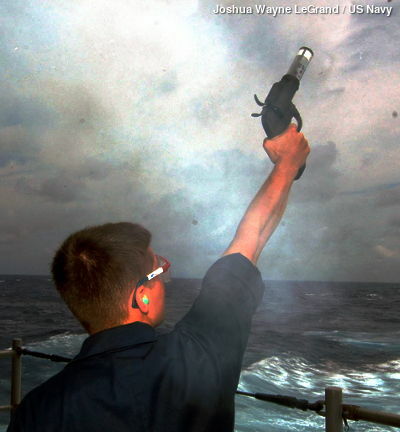 Photo: Firing a flare from the deck of a ship. By Joshua Wayne LeGrand courtesy of US Navy. Another kind of rocket flare is fired from a specially designed flare gun or Very pistol.These flares are aluminum tubes about 3cm (just over an inch) in diameter and 30cm (12inches) or so long. When they're fired, they shoot rapidly to a height of about 300m (1000ft). At that point, they explode with a loud bang and release a brightly burning flare suspended from a small parachute that drifts very slowly downward, maximizing the amount of time for which it can be seen. The Very pistol is named for American naval officer Edward Very, credited with inventing it 1877. There's some controversy over whether the idea was actually conceived by another naval officer, Henry H. Coston, who received a similar patent a few months later and was prevented from filing sooner by his own military duties. Very's 1877 patent describes a fairly simple signal cartridge with a powder charge at the bottom and then some chemicals packed above "of such materials as will cause it to burn with a flame of any desired color." It was designed to soar to a height of roughly 90m (300ft) so it could be seen from at least 5km (3 miles) away. Coston's patent (illustrated in the box below) is quite a bit more elaborate and describes a cartridge that can fire multiple colors in a particular sequence, thus signaling a variety of different codes. 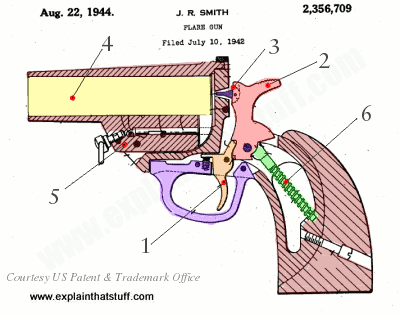 Artwork: From US Patent #2,356,709: Flare Gun by John R. Smith, 1942, courtesy of US Patent and Trademark Office. Flare guns fire cartridges packed with colorful chemicals. These two illustrations are patent artworks for a World War II model flare gun, invented in 1942 by John R. Smith for the Harrington & Richardson company and patented in 1944, and Henry Coston's much earlier (1877) flare cartridge. Trigger: As in a conventional gun, you simply pull your finger back to release the hammer. Hammer: Pivots around a central pin. It's called a hammer because that's how it works: like a conventional hammer driving a nail into wood, it uses a relatively large mass pushing forward onto a relatively small mass (the firing pin), so it magnifies force. Firing pin: Strikes the back of the flare and causes it to explode and shoot off down the barrel. Barrel: Flare guns don't need to fire the same way as conventional firearms (they fire bigger projectiles, don't need to send them so far, and don't need to fire as accurately), and they often have a smooth barrel instead of the rifled (grooved) barrel that you'd find on a conventional gun (which spins bullets and makes them fire more accurately). Flare gun barrels are also wider than those in a conventional gun; in other words, the caliber (internal diameter of the barrel) is greater. A typical flare gun caliber is 26–30mm (1–2 inches), which is about 5 times wider than a .22 rifle (~5.5–5.7mm). Shell extractor mechanism: The barrel can be pivoted for loading/unloading. Main spring: Stores energy to power the hammer toward the firing pin. Artwork: From US Patent: 197,339: Improvement in signal cartridges by Henry Coston, 1877, courtesy of US Patent and Trademark Office. Coston's cartridge has multiple layers of gunpowder (blue), a central fuse (yellow), various chemicals in between that burn to give the colors green (labeled D, bottom), white (F, center), and red (H, top), and some incombustible layers (F and G) in between that keep the signals separate. As you can see from Coston's picture on the right, the three colored signals fire separately, blasting a coded message into the sky. This is a more sophisticated design than Edward Very's cartridge, which contained only one powder charge and only enough chemical to fire a single color. What colors are flares... and why? Red and orange flares always indicate distress and if you see one you need to take action. White flares work in the same way but are usually designed to illuminate an area at night (for example, if someone falls overboard) or to prevent imminent collisions at sea (by indicating a ship or boat's position to another vessel); they don't normally indicate danger. What makes a flare fire red or orange? Just like a firework, it's the chemicals inside, which are chosen specifically so the flare burns brightly and with a specific color. The main ingredients of flares include strontium nitrate (which provides the color—it burns with a bright red or orange-red flame), potassium perchlorate (a powerful oxidizer, which makes the strontium burn rapidly), and magnesium (which burns very brightly). Unfortunately, perchlorates (containing chlorine) aren't very environmentally friendly, so organizations like the US Navy have been working hard to develop perchlorate-free flares using copper (to make a green color) and polyvinyl chloride (to enhance the color). Are there any safer alternatives to flares? As we've just discovered, flares date back to the 1870s—and the basic technology of using rocket-propelled pyrotechnics hasn't changed much in the century and a half since then. Although coastguard regulations still require that you carry rocket flares in many parts of the world, there are some simpler and safer alternatives to handheld flares you might want to explore (or deploy as a backup). There are numerous LED-type distress lamps that will fire intense beams several kilometers/miles across the full 180-degree span of the sky, typically for anything from 6–12 hours. Most can fire rapid pulses of flashing light, while some will fire signals in an SOS pattern as well or instead. Search for electronic/lightning/laser flare and you'll find a good selection. At the time this article was last updated (in 2018), the only approved electronic distress signal that meets the US Coastguard's requirements for night visual distress signals is the Weems & Plath SOS Distress Light, which flashes for up to 60 hours and can be seen for up to 19km (10 nautical miles). Photo: Air Force medics practice setting off rescue flares as part of their survival training. Photo by Efrain Gonzalez courtesy of US Air Force. Flares are a good thing to have with you, but remember that they're to be used only in emergencies. They're designed to get you out of danger but, ironically, they are themselves very dangerous: they contain explosive chemicals and, let off the wrong way, they can cause serious injuries and fires. Flare guns are regarded as firearms in some states or countries and their use may be banned or restricted by law. If you plan to carry flares, be sure to familiarize yourself with exactly how they work before you need to use them. Read the labels carefully, follow any safety guidance to the letter, and don't store them longer than it says on the packet. If you have old, expired flares, don't fire them off: consult your local fire department or coastguard about ways to dispose of them safely. Be sure to find out any rules, laws, or signaling conventions for using flares in your particular country or region. US Coastguard Boating Safety Resource Center: A great collection of general safety advice from the US Coastguard, covering all aspects of marine safety. The requirements for carrying flares are summarized in Q: What Visual Distress Signals must I carry on my boat? (scroll down the page to find it). Code of Federal Regulations: 46 CFR Part 161, Subpart 161.013: Electric Distress Light for Boats: The US Federal law governing electric-type distress flares on boats. Sea Kayaker Magazine's Handbook of Safety and Rescue by Doug Alderson and Michael Pardy. McGraw-Hill Professional, 2003. Guns and Special Weapons: Gun Education and Safety by Brian Kevin. ABDO, 2012. A 34-page introduction to ordinary and unusual weapons (including flare guns and tranquilizer darts), geared to younger readers. Electronic vs. Traditional Flares by Earl MacKenzie. Cruising World, October 22, 2014. Explores the advantages and drawbacks of modern electronic laser flasers. US Patent: 7,988,801 B2: Perchlorate-free green signal flare composition by Robert G. Shortridge et al, US Navy. This is a detailed technical account that explains the chemical ingredients of traditional flares and how a new generation of environmentally friendly versions have modified them to do away with perchlorates. There are also patents from the same team covering perchlorate-free red flares and yellow flares. 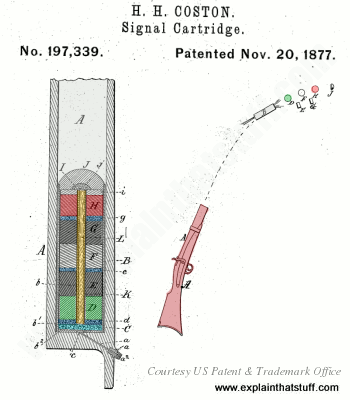 US Patent: 190,263: Improvement in signal cartridges by Edward Very. May 1, 1877. The original Very flare patent covers the cartridge fired from a flare gun, not the gun itself. Note that there are many OCR errors in Google's scan, and you'll need to download the PDF to read it properly. US Patent: 197,339: Improvement in signal cartridges by Henry Coston. November 20, 1877. A rival to Very's famous design, Coston's may well have been invented first.